Korean national kegler, Kim Kyung Min got off the block with a sizzling 279 to lead 2018 World Men's Championships Singles gold medallist, Rafiq Ismail of Malaysia by 10 pins with Lalisang in third, a further two pins away. The Indonesian added another superb 254 in the second game to take over the running with Ismail still in second despite a moderate 202 while Kim slipped away with a poor 162. Hong Kong's James Lui trailed in third with 220 and 226 in his first two games. Although Lalisang stumbled to a lowly 164 in the third, the Indonesian bounced back with 204, 257 and 223 to win the round with 1369. 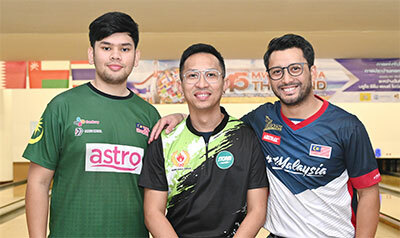 Ismail also suffered a small set back with 174 in the third allowing 2017 Thailand Open champion, Zulmazran Zulkifli of Malaysia moving into second. But Ismail recovered reeling in 238, 231 and 210 to finish second to Lalisang with 1324. Zulkifli settled for third with 1306. 2018 MILO International All-Stars "the Masters" first runner-up, Ahmad Aidil of Malaysia took fourth spot with 1288. A second Indonesian, Billy Muhammad Islam completed the top five with 1281. 2018 ABF Tour Thailand leg champion, Lin Pai-Feng of Chinese Taipei survived by clinching 14th position with 1198 to advance to the next round. Meanwhile, Malaysian women continued to dominate the tournament after Radin Nur Najwa snatched Round 2 victory with 1324. Syaidatul Afifah, who was battling for the lead with team-mate, Siti Safiyah, claimed second spot with 1313. Pace-setter, Siti Safiyah settled for third with 1306 to give Malaysia a 1-2-3 finish. 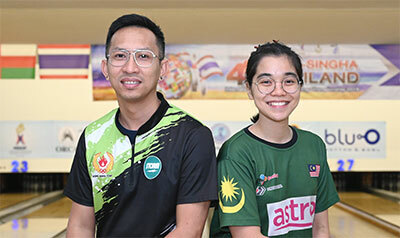 Desperado squad qualifier, Joy Yap of Singapore did well to finish fourth with 1303 after sharing second spot with Syaidatul after the fourth game. Esther Cheah of Malaysia, who took the lead in the start with 255, completed the top five with 1297. Nur Amirah Auni of Malaysia made the cut in tenth position with 1194. The top 10 women and top 14 men advanced to the next round joined by the top 6 women and top 6 men seeded qualifiers for another six games. The top 6 women and top 6 men with the highest pinfalls at the end of Round 3 finals will proceed to the Stepladder Shootout finals later today. Finalists positioned 4, 5 and 6 will square off in the first stepladder match. The winner of the first match will take on second and third-seeds in the second match. Winner of the second match will meet the top-seed in the championship match over a best-twice format for the title.